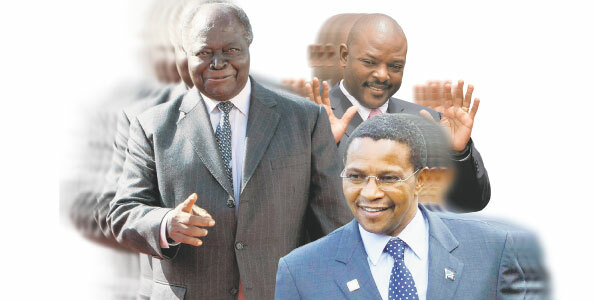 East Africa is set to chalk up political records in the next few months and years, with four presidents stepping down at the end of their terms. If all the East African Community* (EAC) leaders step down, it will be the first time that such a large number of presidents (in political terms) have respected the constitution and left power in an African region. Kenya’s President Mwai Kibaki is the first one up. Under Kenya’s new constitution, elections are scheduled to be held in August 2012, and Kibaki is leaving office. He would become the first leader in the region to bring into place a new constitution, and not hang around in power with the excuse that only he has the passion to implement it. Tanzania’s Jakaya Kikwete, re-elected to a second term last year, will step down in four years. Hobbled with the reputation of a lazy, foreign-trip-loving president who is soft on corruption, Kikwete seems to be busy sprucing his image. Amidst signs that the long-ruling Chama Cha Mapunduzi is in the midst of a shake-up, Kikwete has been pushing some of the more controversial and scandal-tainted politicians off the cliff, or a few of them have saved themselves the humiliation and jumped. In a surprise move last week the colourful Igunga MP Rostam Aziz, once a Kikwete bossom ally, quit Parliament, and said he was also stepping down from all posts in the ruling CCM. Mr Aziz said he had resigned as a member of CCM’s National Executive Committee (NEC) over what he termed as “gutter politics”. “The decision to quit these positions is not in any way a result of pressure nor does it mean I’m giving in to distorted truths about CCM’s rebirth, but my own sincere conviction to stay out of gutter politics and concentrate on business,” he said. In Burundi, President Pierre Nkurunziza is serving his last term, having been re-elected last year. It ends, like Kikwete’s, in 2015. A complex mix of strongman, fundamentalist Born Again Christian, and adept populist critics claim he is angling to change the constitution and give himself another bite at the apple come next election. Part of the apprehension comes from the fact that Burundi’s ruling party, which has a mouthful of a name - Conseil National pour la Defence de la Democratie-Forces de Defence de la Democratie Party (CNDD-FDD) – has a commanding majority in Parliament. In last year’s election that was boycotted by several opposition groups, it won 81 of the 106 seats in Parliaments. Hardliners in CNDD-FDD have been talking openly of amending the constitution, and have the numbers to pull it. If he doesn’t succumb and scratch the power itch, then Nkurunziza too will do the right thing and leave office in 2015. But perhaps the East African president the world is watching most is Rwanda’s President Kagame. No current African leader attracts as much strong international admiration, and an equal amount of vitriolic criticism like Kagame. He is the only African leader to be invited the Fortune 500 meetings, and hobnobs with the most prominent figures in the world like Microsoft founder Bill Gates, former British Prime Minister Tony Blair (who is an adviser), former US President Bill Clinton, and Nicky Oppenheimer, Chairman of De Beers. At the same time, though his critics portray him as the ogre of the Great Lakes and an unflinching militarist whose army has wreaked havoc in the Democratic Republic of Congo, Kagame swats away these criticisms contemptuously, saying his government will do whatever it takes to stop the forces that carried out the 1994 genocide in which nearly one million were killed, returning from their DRC hideouts and carrying out a second round of killings. On Thursday, in replies to written questions from The East African, Kagame said he was looking forward to having the last laugh at his critics in 2017 when his second 7-year term ends. “I won’t be involved in changing the constitution..at all,” he wrote. He also confirmed that early this year, he met with both the Rwanda Defence Forces leadership, and the politburo of the ruling Rwanda Patriotic Front (RPF) and told them categorically that he was serving his last term. “The only remaining task for me,” he wrote, “is how in my present capacity I can contribute to ensuring stability and continuity of progress for the nation”. Kagame first indicated to Nation Media Group editors in Kigali in May that he was planning on leaving. Speaking about last August election, he said his son Ivan, who is a student in the USA, got “special permission” to return and vote him because he had reached the voting age. “He said he had to, because if he didn’t he would never get another chance to vote for me”, he said. His daughter who was 16, on the other hand, was distraught. She begged her father to get a special exemption for her to vote because, according to Kagame, “she knew if she didn’t vote for me she never would get a chance again”. Her wish wasn’t granted. That story suggests that his departure has been discussed at the one place where the most important decisions in African politics are made – around the family dinner table in State House. Kagame would become the first elected Rwandan leader to leave step down from office. The only East African country where the president is not legally bound to serve fixed terms is Uganda. In 2005 President Yoweri Museveni controversially leaned on Parliament to scrap term limits. Early this year he won elections for a fourth elective term, but sixth together with the first two unelected ones. Museveni has since had to endure snipes about being “president for life”. Opinion is divided as to whether in 2016 Museveni will feel that 30 years is enough, or if his appetite for State House will still be large and he takes another dip. In any event, even though every Ugandan president since independence has been run out of power at the point of a gun, the opposition tends to behave better. Last week, opposition Forum for Democratic Change (FDC) leader Dr Kizza Besigye, who has faced off with Museveni in three bitterly fought elections, announced he would step down before the next election. Besigye became leader of FDC at the end of 2005, and though his party’s rules allow someone to be president for longer. Equally, the wealthy former mayor of Kampala city, Ssebana Kizito, who was elected leader of the opposition Democratic Party in 2005, stepped down last year. The title of the most-reluctant political leader goes to Miria Obote. Though the Uganda Party’s Congress (UPC), modelled after the Indian Congress Party, was a power hog and election cheat in power, when Mrs. Obote was elected to lead it after her husband’s death in 2005, she took a stab at the presidency in the 2006 presidential race, lost her deposit, and sensibly gave up its leadership four years later. Should Museveni and the NRM embrace term limits, it would complete the circle and bring Uganda in line with the rest of the EAC states. To President Kagame the fact that in the short period ahead several African leaders will be stepping down from office is a happy trend: “For East Africans, it should be a happy development. It enhances, not reduces, peace”, he wrote. While a final verdict must wait, signs are that pressure for leaders and political parties to be representative are high. South Sudan, which became formally independent a few days ago on July 9, is a good example. After the 2005 Nairobi peace agreements ended nearly 50 years of war between north and south Sudan, the main rebel group the Sudan Peoples’ Liberation Army/Movement that formed the government in the semi-autonomous south didn’t enjoy the pleasure of ruling unchallenged as a one-party dictatorship like nearly all other liberation movements in Africa have traditionally done. Term limits came to South Sudan early and through the cruel hand of death. Its ham-fisted and charismatic leader, John Garang, who was president of the South and vice president of the bigger Sudan, tragically died in Uganda presidential helicopter in August 2005, three weeks after being sworn in. His successor Salva Kiir, a milder and more patient politician than Garang, has faced a fractious SPLM. When elections were held in Sudan in April last year, the SPLM faced a horde of rebellious members who broke off and run as independents. No liberation movement in Africa has had its authority contested so early in its rule like the SPLM; and none has had to hold an election and referendum all within its first five years in office. However, if South Sudan were to be admitted into the EAC in the near future, Uganda would cease to be lonely at the only non-term limit nation. Though the agreements of 2005 had a provision for a two-term limit (with each term being 5 years) in South Sudan, that provision was scrapped earlier this year by the taskforce that reviewed the 2005 draft. This revised document with no presidential term limits was adopted on July 9. For Africa democracy watchers, the next big test and most interesting contest are going to be Kenya’s 2012 elections. On Election Day in 2012, Kenyans will be voting for more than 4,000 elected positions in 47 fairly autonomous counties that have been created by the new constitution. If these positions are contested by an average of 6 people each, the Kenya Independent Electoral Commission will have to organise polls involving 24,000 candidates – a mammoth election rivalled only by Nigeria. Nigeria’s elections tend to be messy and marred by cheating, and therefore don’t inspire. However, if Kenya can pull off an election of this magnitude, then other African countries that are increasingly looking to devolution of power as a solution to their troubled politics caused by sharp ethnic divisions, might well be encouraged to take the same route. **The East African Community bloc comprises Burundi, Kenya, Tanzania, Rwanda, and Uganda.